If you read the story involving the Bahamas in WW II, you know we were seeking more info on the the 47 survivors of a sub attack that sank their boat the Potlach. Those that survived the U-boat attack spent a month in lifeboat. They had a man die from a shark bite and incredibly made their way in the lifeboat from near Ragged Island past Inagua to eventually arrive at Acklins Island. From here, they got a ride on a yacht owned by an heiress to Nassau and eventually reached New York City. If you haven't read this post, I urge you to do so. Author Eric Wiberg is writing a book on German submarines in the Bahamas during WWII which includes this event. He is trying to find out more info on what happened to the survivors on their journey from Ragged to Acklins Island. This is where I got involved in this intriguing detective story. We had quite a day. We have lots of photos and some audio recordings that I’ll put in your dropbox sometime tomorrow, but for now, let me hit the high points. David Parson is indeed buried at Hard Hill/Anderson’s Cemetery, as corroborated by two people who were in Hard Hill when the sailors were there, but after many decades and many hurricanes, no marker remains, if there ever was one. There are, however, several old cement slabs with no identification. It’s possible one is his; also possible sand and time have covered over the exact spot. Reverend Clemese Alberta Collie Cox, 86, a lifelong resident of Hard Hill and the daughter of Capt. Rev. Samuel Collie, co-owner with his brother Alfred (I’m sure you already know this) of the ketch Go On. BTY, everyone who remembered the Go On spoke of her as a two-masted boat, so, Fritz tells me she was a ketch, not a sloop? - more on that later. Capt. Collie lived to be 95 and was pastor of the St. Mark’s Baptist Church in Hard Hill for over 50 years. When he retired, his daughter Clemese took over, a role she continues to this day. Clemese Cox remembers the men, the fact the one died and was buried in the HH Cemetery and that they housed and fed them at the school. She said they had a service for him at the Baptist Church prior to his burial. Doug recorded our conversation with her on his iPhone, so you can hear for yourself. She is a sharp and delightful woman. We took several photos of her, too. The school is still standing. We took photos it inside and out. Mr. W was at home on the hill overlooking the beach in Pine Field when he and his brother and sister saw the boat sail onto the beach. He took us to the spot (got photos) and also showed us the ruins of his childhood home. He reported that the men immediately asked for food. The youngest boy was dispatched to HH to fetch help. Capt. Collie returned to PF with the Go On and towed the men and metal boat to HH, where they walked or were carried into the settlement - a distance of a couple of miles. I did ask him specifically if the Go On had been towing the metal boat when it landed. He said no. Best for you to hear this for yourself on the recording, I think. Interesting, though, huh? As for the Go On, the folks we talked to who remembered it all believed it was sold at some later date and went to another island. No leads on Constable Bain or the metal lifeboat. Lots of head-scratching on that one. Anyway, lots of fun. Wonderful people. Some sweet photos coming your way tomorrow. YES, TO ALL OF YOU THAT HAVE FISHED ACKLINS ISLAND, THE MAN WHO FIRST MET THE SURVIVORS WAS NEWTON WILLIAMSON! YES, THE NEWTON WILLIAMSON, OWNER OF GREY'S POINT BONEFISH INN AND A MAN I HAVE KNOWN FOR 20 YEARS. I HAVE NEVER HEARD THIS STORY BEFORE!! I thought this was so incredible, I'm including the entire interview with Rev. Williamson in the next post. This interview gives an wonderful insight into the Bahamas during World War II. Newton was only 7 or 8 years at the time. I'll post the interview in the next few days. Very cool story. Newton hasn't changed a bit and looks like he's still getting after it, building stuff and working hard. Yes!! Kendall told me he stills like to run his big CAT!... dig ditches, grade the road etc. The book is published! UBoats in the Bahamas on Amazon and www.ericwiberg.com. 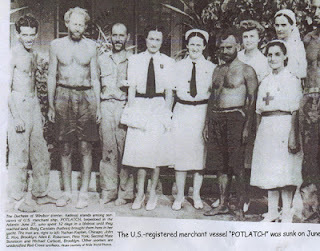 I am working on a book just about this ship and crew. Good to Go for Trout in Wyoming?